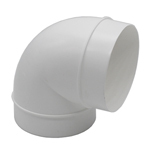 Kair 150mm female to 100mm male round ducting adaptor. 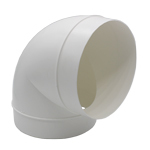 The 150mm ducting end is a female socket (the same diameter as rigid 150mm ducting pipe). 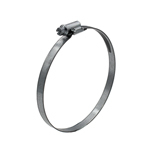 Male fittings such as connectors, bends, and grilles will fit straight in to the socket. 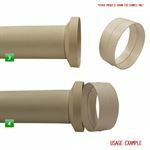 If you wish to connect this to Kair 150mm Straight Pipe (Part: "DUCVKC650") you will require a male connector / coupling (Part: "DUCVKC365"). 100mm ducting end is male and will fit inside Kair 100mm straight ducting (Part: "DUCVKC250") without the need for a connector. Looking for an Alternative Sizes? 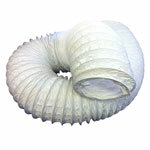 Here at i-sells.co.uk we stock a full range of metal and plastic ducting adaptors, reducers, and connectors. 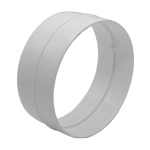 Perfect adaptor from 6 inch to 100mm diameter. Was unable to source from any other supplier at a reasonable price, so purchased from here ! The product is basically as expected. The bigger end is just a little bit loose for the defined size. However, it can be used as intended for my project. Always got what we require. good delivery on time no hassle at all buy confidently. Effective item - does the job. Excellent quality item. As expected. The 150mm is exactly 150mm outside diameter which cannot be mounted on a cooker hood which is also exactly 150mm (German technology). Saw the 150mm edge in 3 places so that it was forced to connect to the hood. 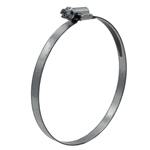 If it is an adaptor, should it be slightly bigger so that it can be mounted on any 150mm hoods? Very pleased with the Ducting Reducer. Very prompt delivery and was just what I required. It works fine but had to use hot air gun on the pipe to get it to fit. 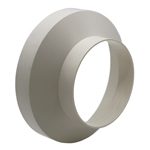 I-sells was able to supply some 'hard to find' fittings in both uPVC and galvanized steel at competitive prices. Delivery was prompt and flexible to meet my specific requirements. 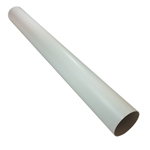 Products are of good quality and accurately described on the website. Perfect for the job, they fit well and an excellent service. 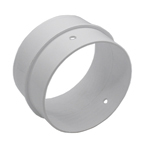 We look all over for this size of reducer, so we decided to google it and found you site. 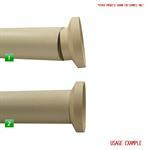 Your site was quick and easy to use, the product arrived the next day, my husband fitted it the next day and everything is working. Excellent, will shop with you again if needed. Thank you. I AM SO GLAD TO HAVE FOUND WHAT I WAS LOOKING FOR . IS HTE DIMENSIONS INSIDE DIAMETER or OUTSIDE DIMETER. Thank you for your question. 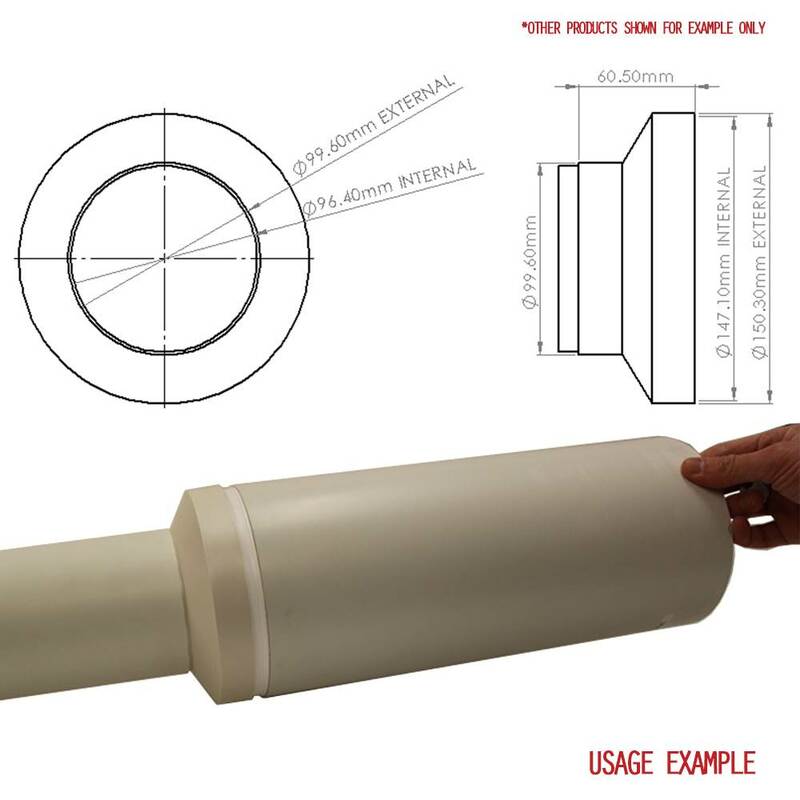 Please see below the dimensions of the reducer. I need to replace the ACM100T unit and wanted to see if I could use the more powerful ACM150T with this adapter to use the existing ducting? Thank you for your question. Yes this item can be used but your airflow will be reduced quite a bit as you are going from 6"- 4". I want to use this to connect 6" flexible bethroom extractor to 4" roof tile outlet will it do it and how best to attach pipe and it to outlet? 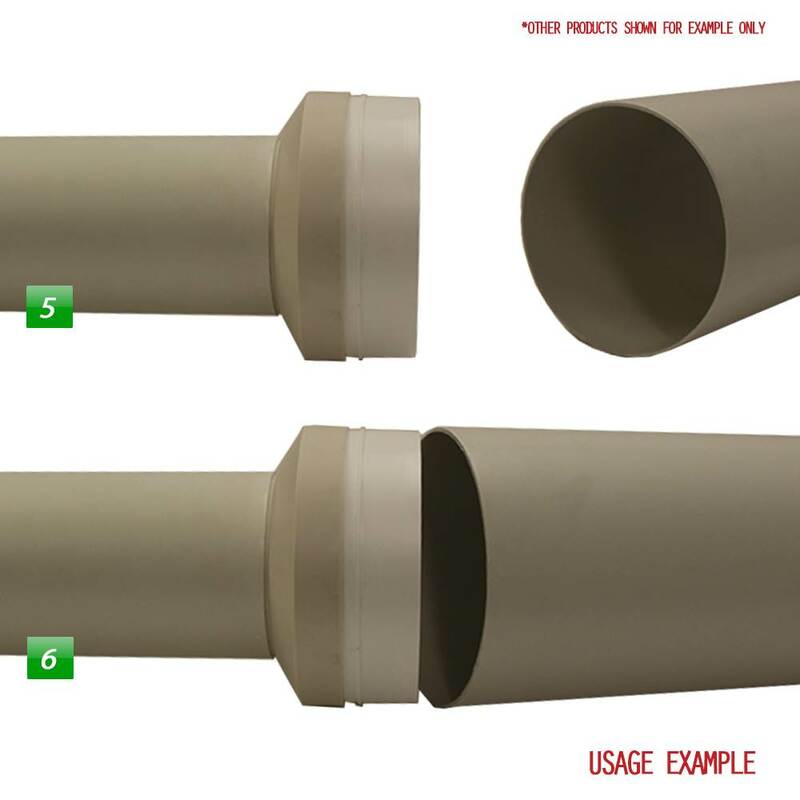 The 150mm connector (Quick Search) QS284 will connect the reducer and your 150mm flexible duct. 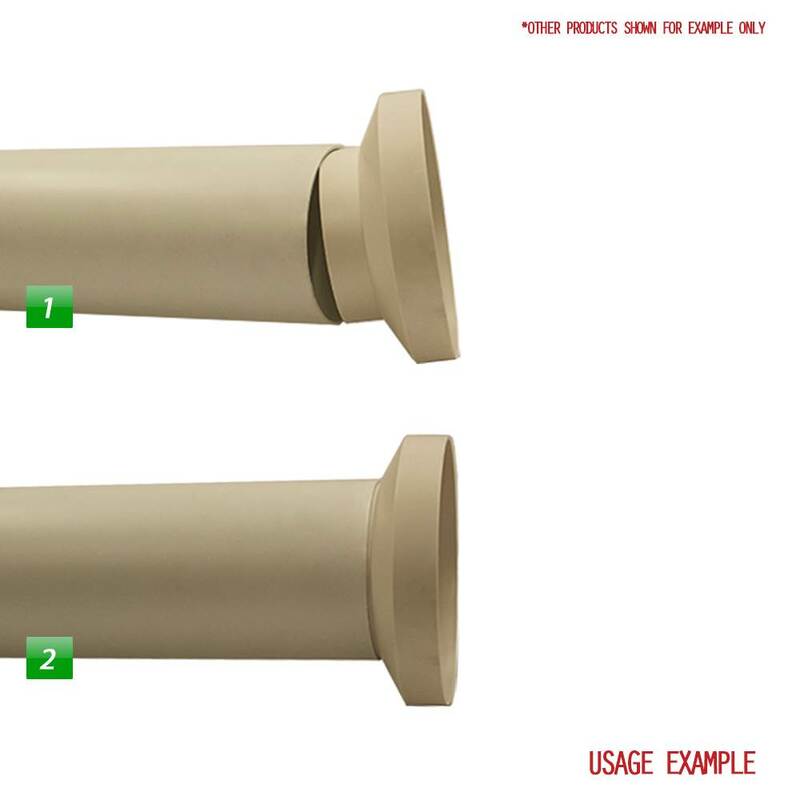 I cannot be sure what type of spigot you have on the roof tile but these are often the same type of hard plastic reducer in which case you would need a cut section of straight pipe like QS193 to connect the two, duct tape will complete the connections. The duct on the extractor is exactly 150 and we need to connect on to 100 flexible ducting. Would this reducer fit.